Wow! 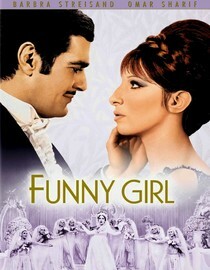 I just finished watching this movie starring Barbra Streissand and Omar Sharif. What a man! What a couple! They look so beautiful together! I had so much fun! The music is lively and contagious; the plot so fresh and funny. This film is about Fanny Brice (Barbra Streissand in an Oscar-winning role), a skinny, Jewish girl with an amazing voice and good comic timing, who starts working in a small theater and later becomes a Broadway superstar. Along the way she meets Nick Arnstein (Omar Sharif), a gorgeous gambler with gent’s manners, and they fall in love…They get married, have a child, and just when life seems utterly perfect, things start to crumble and threaten to tear them apart. What starts as a musical comedy ends up being a drama that will leave you breathless!